There is something profoundly wrong with a person like Romney. He lies upon exhaling. His latest whopper is that Chrysler planned to move Jeep production to China. Sergio Marchionne, Chrysler CEO, says that it’s just not true. 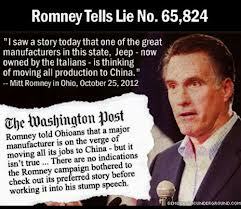 Throughout the campaign Romney has doubled-down on lie after lie. Maybe this 2005 USC study can shed some light on Mr. Romney’s pre-existing condition. This entry was posted in Other on November 1, 2012 by speakingthosethings.